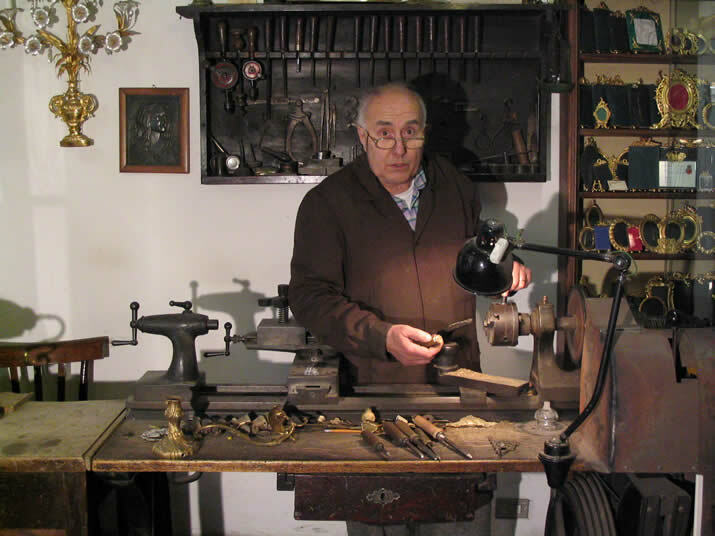 The BanchiÚs workshop on Via dei Serragli follows in a long tradition of Florentine bronzecraft. The shop was moved to its current location in 1925 by Vasco Cappuccini (1895-1965), who was an apprentice of Emilio Ercolani (1850-1919), who in turn was an apprentice of Giovanni Stanghi (1830-1890), colloquially known as ¿LeprinoÀ. Many of the tools in the shop even today belonged to Stanghi. Lamberto Banchi started his apprenticeship with Mr. Vasco at age 13 in 1946 and took over the shop in 1965. His son Duccio is now officially the boss of the shop, although Lamberto does not feel that the day begins well if he cannot beat his son to the shop in the morning. The bottega specializes in producing photographic frames, table lamps, wall lamps and door handles and knockers. They can also custom produce a myriad of bronze and brass objects at the request of their clients. 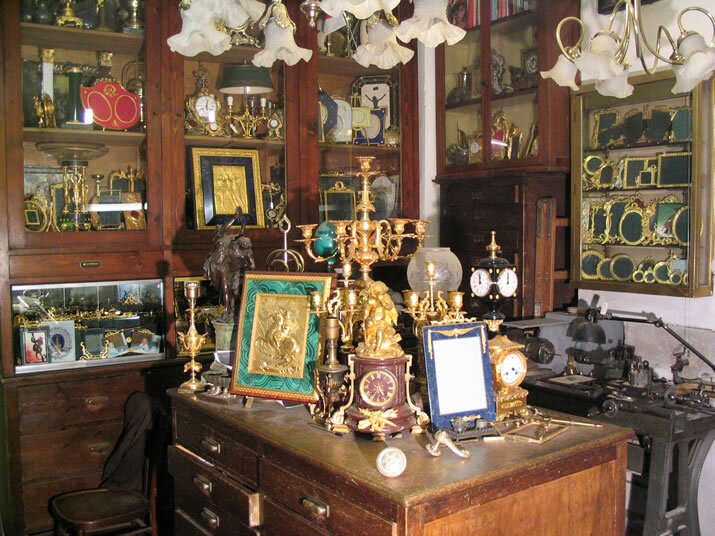 They also restore antique brass and bronze objects, such as antique bronze clocks and statues. Given their strong connection to the local artisan community, they have ready access to artisans who can repair parts that are not metal. A ¿BronzistaÀ (that is, ¿BronzistÀ) is an artisan who crafts ornamental objects from, not surprisingly, bronze. Notwithstanding the name, a bronzista more likely craft items in brass. Bronze is an alloy of copper and tin while brass is an alloy of copper and zinc. The proportions of metals in the alloys can be varied depending the level of hardness or workability desired in the ally. One of the main differences between the two alloys stays in the fusion point: bronze melts at 1100 degrees C and brass at 900 C. When in a molten state, brass is much more fluid than bronze, making it suitable for casting small and precise objects. Bronze tends to be more suitable for larger objects or where greater hardness is desired. For example church clocks or cannons are more likely to have been cast in bronze, whereas pendulum clocks, statuettes, ornamental decorations, and picture frames are more likely to be made of brass. The first step is to start with a design, either than of the BanchiÚs or one brought in by a client. The design is then transformed into a three dimensional form by carving a wood model of the desired object. This wood model is then pressed into a wax form. In the foundry, this form will be placed in a ¿clampÀ with pressed earth (the so called ¿french EarthÀ), then removed, forming an empty space called a moulder (or founding). In case the object requires a production run of more than a few examples, the moulder will be made of rubber. This moulder will be poured with the molten metal alloy until full. After the metal has sufficiently cooled, the moulder will be opened and the cast metal object removed. At this point, the surface of the object is quite rough. It is the finishing of this rough object that determines the quality of the work and demonstrates the skill of the bronzist. 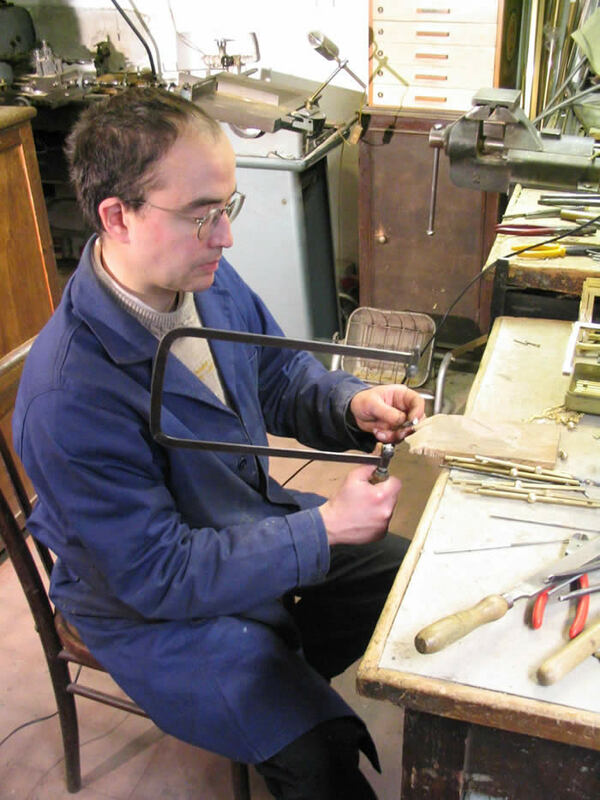 Frequently, the final object (for example, a picture frame or a table lamp) is welded together from several cast. The Banchis finish the metal objects almost entirely by hand using tools such as files. After the surfaces of the objects are smoothed, the object are chiseled by hand in certain areas in order to obtain the ¿definedÀ look characteristic of high quality bronze or brass objects. This hand-worked look, along with other characteristics such as the heft of the objects, is what clearly distinguishes the bronzistÚs crafts from mass produced brass objects with their stamped-out look. Finally, the object is finished by being polished, silver or gold plated, or given a particular ¿patinaÀ requested by the customer.